Paris is known for its Christmas Markets, which offer a huge variety of things to buy and enjoy, as well as great opportunities for strolling and window shopping. 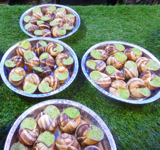 Escargots, with garlic and parsley butter, ready to be heated and served in the Marché Gourmand. Now you really know you're in France! There are lots of ways to do your holiday shopping, and Paris offers some large and interesting Christmas Markets to explore. One of the best known is the Christmas Market on the Champs-Élysées, which is open from mid-November until early January—that's a lot of shopping days! Consisting of hundreds of small wooden chalets, its offerings range from gourmet food to jewelry to children's toys, and much more. Originally craft based, the market has evolved to include more commercial products, as well as artisanal crafts. Some of the more bizarre offerings we saw included a food stall that suggested that you "pimp your hot dog," and a vendor offering "face banks." Do you suppose he wants a new hook for Christmas? There's something for everyone at this Christmas Market, which runs on both sides of the Champs-Élysées, from the Place de la Concorde to the Rond Point at Franklin D. Roosevelt. There's plenty of food, including a whole Marché Gourmand, where you can get everything from escargots (snails) to foie-gras burgers to oysters from Brittany. If you're thirsty, your choices range from hot chocolate to champagne. You'll find stuffed animals, jackets, tee shirts, and sweatshirts, as well as earrings of all types, buttons and pins, scarves galore, a variety of purses and hand bags, and lots more. There's also an ice skating rink, for those who want an adventure. While you might forget that you're in Paris as you get caught up in the decorations and shops, all you have to do is look across the Champs-Élysées and realize that the market takes place in the shadow of the lovely Grand Palais. The beautiful Grand Palais is a wonderful backdrop for the Christmas Market. And if you look down toward the Place de la Concorde at dusk or in the evening, you'll be treated to the lights on the Roue de Paris, the giant ferris wheel (which you can also ride). At night, you might even see Santa and his sleigh flying over the night skies. 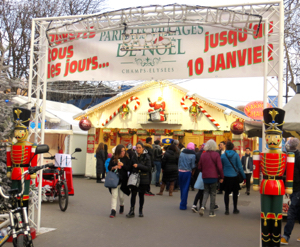 The largest Christmas Market in Paris is held at the Place de la Défense. To get there you'll need to take Line 1 of the Métro to the end of the line, La Défense. With over 300 chalets covering 10,000 square meters (108,000 square feet! ), you'll want to plan to spend some time there. And of course, in addition to the shopping opportunities, you can also find lots of places to have lunch, dinner, or a snack. The La Défense Market is open from mid-November until just after Christmas. 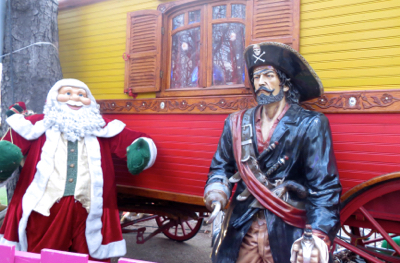 There's a small Christmas Market near the Gare Montparnasse, with a dozen or so booths, and you may find other markets in such areas as the Parvis of Notre-Dame Cathedral or the square in front of Saint-Sulpice Church. Above, Entrance to the Christmas Market, Champs-Élysées, Paris. 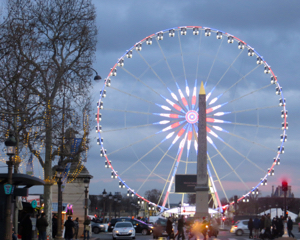 Below, The Roue de Paris, at the Place de la Concorde, at the end of the Christmas Market. 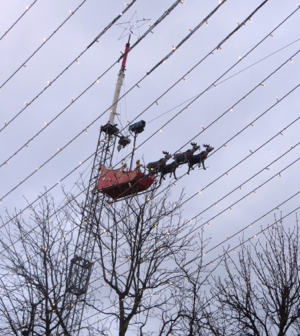 Above, Santa's sleigh flies above the Christmas Market four times each evening!